Brands : BALCO, NALCO, HINDALCO. We are one of the most leading supplier of Primary Aluminium Ingots. Available in various grade, brands i.e. 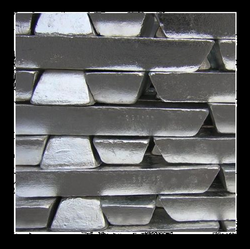 We supply high-purity Aluminium Ingots of upto 99.85% purity of Nalco, Balco and Hindalco make. Our primary metal product range includes EC grade, CG grade and high purity ingots, sow ingots, alloy ingots, billets and wire rods. We are offering Nickel Aluminum Bronze Ingots to our client. We are offering Aluminum Ingot to our clients. We can offer you Aluminium Ingots as per customer requirement. Aluminium Ingots purity above 98%. We already supply Aluminium Ingots to Ahmedabad, Baroda, Surat, Rajkot, Jamnagar, Mumbai, Pune, Aurangabad, Delhi, Jaipur, Kolkata, Banglore, Chennai, Madurai, Cochin etc. We are looking for buyer of Aluminum Alloy ingot. 10 Kgs. to 250 Kgs. Al, Sn, Si, Mn, Fe, Ni, Pb, P, Bi, Te, Se, As, etc. We are specialize in offering a wide gamut of aluminum ingot for molding, we have gained huge clients base across the globe. Our range of aluminum ingot is widely used in engineering and casting industries for molding purposes. Offered range of ingots is available in different structure, shapes, sizes and are customized as per the specific requirement of the clients.